Vande Mataram is the outrage of the day. Unfortunately, this happens on the day which marks the death anniversary of great writer and revolutionist, Shri Bankim Chandra Chattopadhyaya. We have come to a decisive state in the life of our nation. A nation which gained independence in 1947, and struggled to get on its feet for seventy odd years, scraping through periods of emergency, has come on its own. There comes a time in the life of its nation, where it stands up on its feet and asserts itself. A nation is not a piece of land, nor is it about its building. Nation is an idea, always an idea. Secure minds create an idea of nation which is unapologetic, independent, guiltless, proud and assertive. Such an idea is always open and stands above the ideology. Insecure minds imprison that Idea. Then they try to tell you as a nation how you should behave. That is my problem with forty second amendment to the Constitution, which was sneaked in by Congress leader and then Prime Minister of India, Mrs Indira Gandhi. Socialism is an ideology and when you include it in the definition of a nation, you are compromising on the idea of the nation. But then that is how politics has been in India. This was done when the same idea was absolutely rejected by Dr. BR Ambedkar at the time of framing of the constitution. It is absolutely interesting that the Congress which trampled over the spirit of constitution (when pushed to include socialism in constitution by Mr. KT Shah, Ambedkar termed it- destroying democracy altogether; not surprising, 42nd amendment came in the middle of Emergency) keeps going back to Constitution all the time. The intellectual elite feeling overwhelmed by the native, Hindi speaking Indian negating all their advises in UP do not even understand when they stop opposing Modi and start opposing a nation. What could be sorrier than the fact that the Death anniversary of Bankim Chandra Chattopadhyay is celebrated not with twitter hashtag #VandeMataram, rather media channels are celebrating it with #VandeMataramRow. The out-of-power Congress opposes the imposition of Vande Mataram and make confusing noises, somehow equating it with the idea of Hindu Rashtra which belongs more to RSS than to BJP, and call it Anti-Muslim. Let us look at the journey of this song. The words and description clearly bring home the point that the poet refers to the land as the mother. When one talks about the riches of nature, one definitively talks of the land, the motherland. The references to Durga in subsequent verses can be traced to the story of Anandmath wherein the nation is mentioned in three forms, Jagaddhatri – the benevolent, all-giving mother (which it was), Kali - The incarnation of death, the taker of lives (Which it has become) and Durga- the warrior Goddess, which it must become to escape the dark age of colonial history. The poet is not a priest, as we see, and has not written it as a religious tome. For him, Goddesses are stages in the life of the nation. Still, in consideration of the hyper-sensitive feelings of bigoted Muslims, Constituent assembly decided to take initial two verses which had no reference to Durga as a National Song. 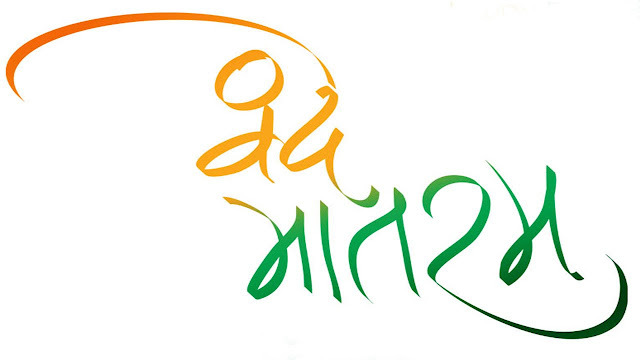 The composition consisting of the words and music known Jana Gana Mana is the national anthem, subject to such alteration in the words as the Government may authorize as the occasion arises; the song Vande Mataram, which has played a historic part in the struggle for Indian Freedom, shall be honored equally with Jana Gana Mana and shall have equal status. It is therefore unfair on the part of the people and the liberal elites to try to belittle the song as any other song. SP spokesperson on the TV debate mentioned that Tagore was opposed to the song, which I have mentioned as incorrect, since he was first to sing the song in Congress convention in 1896. It was later sung in subsequent congress sessions in 1901 and 1905. I also dispute his contention of terming it as any other song, equating it with “Sare Jahaan se Achha” adding that he is son of an IAF personnel and has sung that song only in schools. I dispute it as the son of IAF personnel (though it has nothing to do with nationalism or patriotism of an individual, but since he said it, I too shall say it), since Vande Mataram is always sung at end of events in Kendriya Vidyalaya where most defense personnel’s wards study. His attempt to colour Vande Mataram as any other song is wrong and does not stand to the statement made by the first President of India as above excerpt from the Constituent assembly debate shows, which places it at an equal importance as National Anthem. Lala Lajpat Rai ran a nationalistic Newspaper by the name of Vande Mataram and many freedom-fighters bore the atrocities of the British and gave their lives with this song on their lips. It was only in the aftermath of Emergency and the later times around end of 90s and 21st centuries that the religious issues with respect to Vande Mataram came into being. Whether this resulted from the global rise in fanaticism or by carefully cultivation of half-read dissent by those who were in power but found it slipping through their fingers is a matter of serious introspection for us as a nation. Nehru also said in 1948 in constituent Assembly debate: It is unfortunate that some kind of argument has arisen as between Vande Mataram and Jana Gana Man. Vande Mataram is obviously and indisputably the premier national song of India, with great historical tradition, and intimately connected with our struggle for freedom. That position is bound to retain and no other song can displace it. In 1946 speech in Assam, Gandhiji even advised that Jai Hind should not displace Vande Mataram. He feared that if we started on that path, where would we stop? All these historic perspective leaves us with only one point, can the song be forced on people? Now this is a question which is more legal in nature than philosophical. It should be the courts which must answer it. After all it was Supreme Court of India which sneaked in National Anthem into the private entertainment space of the citizens. It is really sad that SC in its other decision had to use the words- Constitution has no concept of National Song. It was a sad thing to note given the statement of President of India in Constituent assembly. If it is missing in the Constitution then it should be brought in as amendment in line with the spirit of the CA. When 42nd amendment can be done (and it stays) which being categorically refused by the CA, how come Vande Mataram is still not in the constitution? Leaving alone the private and public spaces, when it comes to Government bodies, events and spaces, they are well within their right and owe the obligation to numerous freedom fighters who fought for a free nation, which they have come about to rule and govern, to make National song mandatory. It is absolutely hollow to render it the color of human emancipation or link it the freedom of citizens. Why should the citizen stand upright at the time of national anthem? And I put forth the same fear which Gandhiji expressed, " Where will we stop?" A nation is bound by rules, and stands on it. Rules will apply equally on strongest of its people and thus offer structure and security to the weakest of its people. Vande Mataram should not be forced, but the important counter-question to it is – why should there be a necessity for it to be forced? Some go even as far as to claim that Islam does not allow bending before another anyone except God. I would only advise them to go through the court practices of Mughal. Muslim courtiers happily followed the customs of Kornish and Taslim. Akbar even introduced Sajda, which was later discontinued in Diwan-e-Aam (the common audience) but continued in Diwaan-e-Khas. No one had problem bending in front of mere mortal, while here it is motherland we speak about, which is nothing but the nature as the poet elaborates in his words, which in turn is nothing but manifestation of God. As a nation, if we do not stand for anything, we will fall for everything. This we stand for, defines our character as a nation. This national character and national pride is necessary for the well-being of a nation. We cannot forgo it.